And Why, Dammit, Aren't You Growing? Some people do not know anything about it, while others have slightly forgotten the fact that former Yugoslavia had a partnership agreement with the EU back in 1980 and that in June 1999 the European Commission offered measures, aimed at improving the relations between them, but as the country fell apart and conflicts and wars followed the situation changed. What would have happened if the ex-Yugoslav republics did not follow their own paths we can only guess, as we can guess what is going to happen with those of them which 20 years later are at different stages of their EU accession. When last December the EU accession treaty with Croatia was signed (it will become effective in July 2012), the question was where the former Yugoslav republic was headed to and some even compared the situation with getting aboard of Titanic, after it had hit the iceberg. A new round of forecasts, backed by a lot uncertainties about the future of this process appeared in the last few days after last Thursday (March 1), between delaying Romania's and Bulgaria’s entry in the Schengen area and the signing of the new fiscal pact, the European Council supported the recommendation of the EU foreign ministers Serbia to be granted a candidate country status. The euphoria, which is typical for such moments, was cooled in the period between the decision to give green light and the announcement of the official decision, when three member states showed their reserves about this decision. And while Lithuania and Poland conceded quite quickly, Romania’s position remained as a final hurdle before Serbia. Whether Romania was right to remember about its Vlach minority in Serbia at this very moment and whether this was a real threat, is not the most important issue. More important is that such hurdles are likely to become more and more in the future. Because of similar hindrance Macedonia received a candidate status back in 2005 and has been recommended to start negotiation, but this process has so far not been launched. For a similar reason the start of EU talks with Croatia was delayed several times and the negotiations themselves took some six years to be completed. That is why, according to some analysts, receiving an official status is even a bigger step for Serbia than getting a date for the start of accession talks. 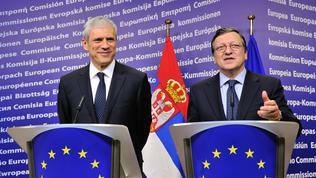 It is already clear that Brussels does not have to wait until the progress report on Serbia is released in the autumn in order to set a date for the start of the negotiations, but it is also quite certain that it will not take any decision before the presidential elections in the country, which are due to take place in end-April or in the beginning of May. 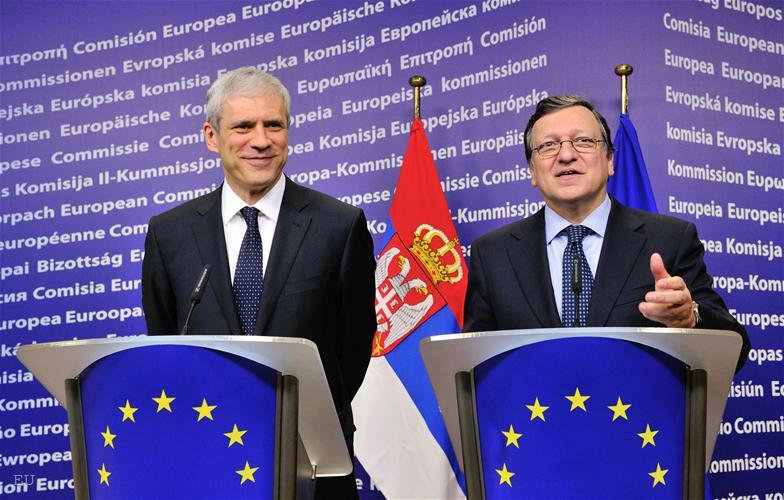 Only after the elections the dialogue between Belgrade and Pristina can be resumed, which according to EU Enlargement Commissioner Stefan Fule is a key factor for Serbia’s future EU integration. “The talks between EU and Croatia took five years and ten months because of the fact that some reforms happened too slowly, while in the case of Serbia this time will depend on the efficiency of the needed reforms, which it will carry out,” Croatian analyst Damir Grubisa summed up the situation in a interview for Radio Free Europe. The director of the Zagreb-based Centre for European Studies is rather optimistic: in his words Serbia’s candidate status is a positive signal for the stability of the whole region, while EU’s problems come not from the strong, but from the weak integration in it. According to Grubisa, EU’s role is to help smaller countries to use better the instruments that are made available to them, so that they can better position themselves along the bigger players. In an article titled “The Hard Times of a Candidate”, Serbian magazine “Vreme” [Time] reminds that Hungary’s EU accession negotiations lasted between 1994 and 2004, while for Slovenia this period was between 1998 and 2004. The magazine expects that on the basis of these examples, the train for Brussels, of which Javier Solana (the EU's high representative for the common foreign and security policy until December 2009) said was ready to depart in 2008, would travel at least six-seven years. And taking into consideration the current situation in Europe, the article adds, our long journey to Europe would take as long as the existing of first Yugoslavia – between 1918 and 1941.